“They say you’re only as old as you feel. Unfortunately, once the gray creeps into your face it doesn’t really matter how young you feel, since those around you will simply assume that you are on the other side of the great divide that is middle age no matter how long you can hold crane pose. Most men deal with the onset of white facial hair in a three-step process. During the first step, they ignore it – until someone yells out, “Hey, grandpa!” or offers up their seat on the overcrowded subway. Or worse, until they have a first date or a job interview. And this leads to step two: they try to fix it. This process usually begins with a trip to the local drugstore and the purchase of beard dye. That’s when they realize what a messy, smelly, and time-consuming hassle it is. Some men give up right then and there, because they can’t take the harsh ammonia smell. Those who suffer through often realize – either immediately, or over time – that they’re allergic. Once your face reddens and swells, it’s too late. Many sites have sprung up, documenting beard dye horror stories – along with a plethora of law firms suing beard dye manufacturers for chemical burns. One option is HENNA DYES. (prices vary; appx. $13-20/application) Some men then switch to henna dye because they believe it’s gentler and more natural. You can get a good result with henna dye, and it does indeed appear to be gentler than harsh chemical dye. But it is expensive, takes forever to apply and requires several applications to build up color density. Also, darker colors like black are tough to achieve with henna. Be aware that it should be applied regularly to build up the proper color intensity for several weeks, you have to wear gloves – and beware dripping/staining during the long application time. 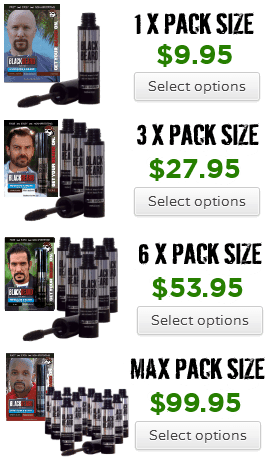 And then there’s BLACKBEARD FOR MEN ($9.95/appx. 4-6 weeks’ worth of applications). Blackbeard for Men founder “Cap’n“ Jim Cirile went through the above process and came to the conclusion that there had to be a better way. 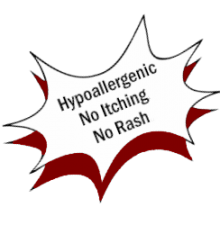 He wanted a product that was fast and easy to apply without any harsh odors; one that looked 100% natural and was hypoallergenic. Turns out, it didn’t exist. So the intrepid “Cap’n” set out to create it himself. And thus patented Blackbeard for Men Formula X was born. 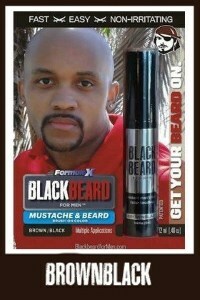 Blackbeard for Men isn’t a dye, but rather, is a topical colorant. It applies in seconds, lasts all day, is water resistant, and has none of the drawbacks of dyes. It can also fill in beard gaps. Additionally, if one choses, one can leave some gray for an even more natural look. It can also be used on eyebrows and sideburns. And if someone really likes their beard dye, then they can employ Blackbeard for Men to touch up those fast-sprouting gray roots. The downside is it is temporary, so one needs to get used to the idea of applying it every day (or when needed,) which generally takes less than a minute. The Cap’n and his crew are honored. Thanks swashbuckling laddies for yer kind words. ← Best Beard Color! Say What?